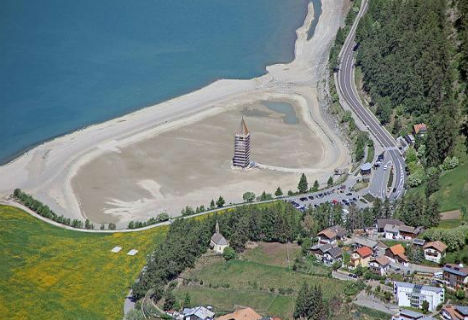 All that remains of the old Curon Venosta is the tip of a bell tower, emerging from Lago di Resia like a tombstone for the flooded town. The alpine village was inundated with water shortly after World War II when officials decided to join three pre-existing lakes into one large man-made lake. The entire town is still down there, filled with sand. 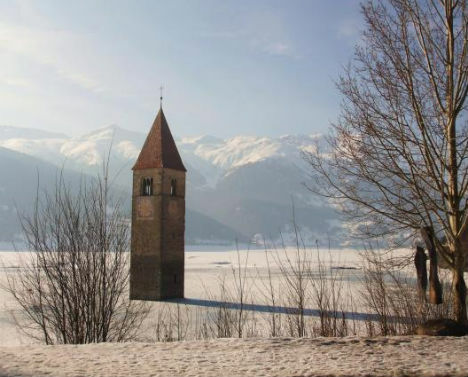 Located in the Italian Alps, Curon Venosta (known in Austria as Graun) was rebuilt at a higher elevation. The point of joining the three lakes together was to create a hydroelectric dam. In addition to the town of Curon Venosta, 163 houses and nearly 1,300 acres of land planted with fruit were flooded. The church from which the Campanile di Curon rises was built in the fourteenth century. The bell tower has been left to stand as a historic memorial, and was restored in 2009 to repair cracks. 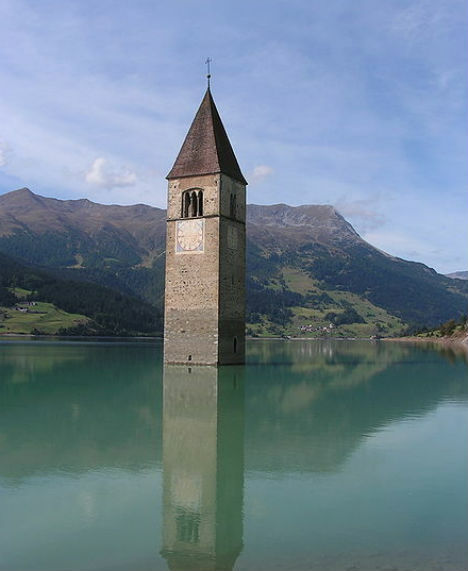 The tower, as seen above, is surrounded by sand, during recent renovations at which time the lake level was lowered. 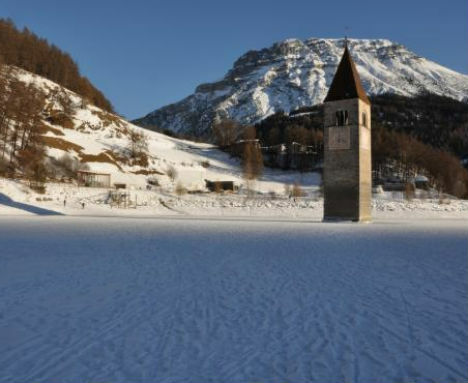 In the winter months, when the lake freezes over, it’s possible to walk right up to the spire. Local legend has it that though the bells were removed during a restoration in the 1950s, they can still be heard ringing inside the tower. The project was originally planned in the early 1900s, plans drawn in the 1910s and grants given in 1920s with work started in the late 1930s, but its full execution was delayed in part by the second World War thus not finished until the 1940s.